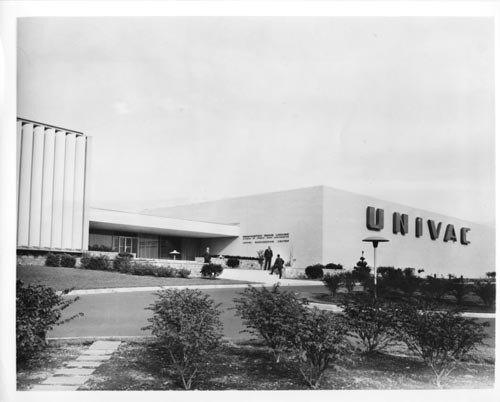 Black and white image of UNIVAC Engineering Center. Verso paper sheet: " UNIVAC Photo #1 The discovery of better ways to build electronic computers is the purpose of the new UNIVAC Engineering Center in Whitpain Township, Pa., which was formally decicated on Columbus day, October 12. Representing an investment of $20-million by the Sperry Rand Corporation, of which Remington Rand Univac is a division, the Center has elaborate facilities for reseach in solid-state physics, thin-film memories, electro-plating, programming and other areas of computer technology. Over a thousand scientists, engineers, technicians and administrative personnel are currently working at the Center which is located on a 112-acre tract in suburban Philadelphia. For further informationA: J.D. Wood, Remington Rand Univac, 315 Park Avenue South New York 10, New York, SPring 7-8000,ext 326"
Verso blue stamp: "Entered Mar 13 1998"